Iran’s recent charm offensive is likely a ruse. But the only way to find out is to try diplomacy. This Tuesday–whether in a possible meeting or simple photograph beamed across social media–the world may get a glimpse of what could be a possible U.S.-Iran rapprochement building steam. While the pitfalls and challenges to any warming of relations between Washington and Tehran would be great, it is clearly in both nations’ interests to pursue such an effort. America should test Iran’s new willingness to engage, but with its eyes wide open. Clearly, recent events in both nations could pave the way towards a possible compromise. Iran’s new president certainly is undertaking a bold approach that is a breath of fresh air when compared to his predecessor. Still, his words must be understood in the broader context of Iran’s economic and geopolitical position, which has been greatly impacted by U.S. and EU sanctions. Iran’s economy is, to put it bluntly, a hot mess. Before crippling American and EU sanctions came into effect, Iran’s oil industry was exporting approximately 2.2 million barrels per day (bpd) of oil. Today, that number has been cut in half. This has had a profoundly negative effect on Iran’s economy in many ways, including depleting its foreign currency reserves, 80 percent of which have come from oil exports in recent years. Iran’s economy last year shrank some 5.4 percent, with sanctions playing a large role. Inflation has reached staggering levels, with unemployment rising dramatically. U.S. President Barack Obama also has incentive to follow-up on any possible warming of ties—but for very different reasons. Namely, America is very much now a player in the ongoing nightmare that is the Syrian civil war and Iran could be a possible partner in helping reach some sort of political settlement. Considering the American people’s opposition to most forms of active assistance to Syria’s opposition, finding a way to end Syria’s civil war with help from other interested parties could have its advantages. A major foreign policy achievement could help Obama’s sagging poll numbers, and prove to be a rare bright spot amid a looming government shutdown and the ever-present threat of an American default on its debt obligations if a debt ceiling agreement is not reached. Yet, Rouhani and Obama would need to tackle the main issue that keeps both nations at odds with each other: Iran’s budding nuclear program. 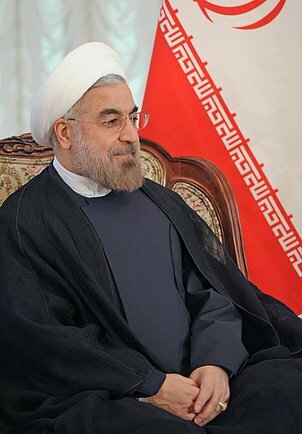 Rouhani almost certainly believes Tehran’s nuclear program is a national right. In his Washington Post op-ed he explained that, “a constructive approach to diplomacy doesn’t mean relinquishing one’s rights,” a clear reference to Iran’s nuclear program. Could Obama, in today’s poisonous political climate, reach an agreement with Iran that allows it to keep parts of its nuclear program without being accused of betraying allies in the region? Does Rouhani have Ayatollah Ali Khamenei’s blessing for such an agreement? Certainly the devil would be in the details—and both sides would be required to sell these details to their respective domestic political environments. Still, while many of my friends on the right would disagree with me, it would be foolish not to explore such an opening. It seems highly unlikely that Rouhani would have made the foray into “op-ed diplomacy” without the blessing of Ayatollah Ali Khamenei, the real power in Iran. Khamenei’s own recent speeches reinforce this impression. Indeed, America should carefully embrace any initiative that seeks to forge stronger relations with an adversary that could ultimately make the world a safer place. But nations act in their own interest, and Iran will certainly have its own motivations for seeking a deal, whether they are to get the sanctions removed or to try some sort of ruse to buy time to develop a nuclear weapon. So my advice to Obama: There is nothing wrong with shaking hands or glossy photo-ops at the UN come Tuesday. But begin negotiations quickly. Test Iran’s willingness to compromise. Insist on complete transparency. Demand that nuclear inspectors have unfettered access to any and all suspected sites. If negotiations are met with delay, stalling or unrealistic demands, then the world has its answer. But if Iran is serious, and has changed its calculus, then America has a responsibility to see this through. Although Ronald Reagan’s phrase has been overused in recent weeks, trust but verify seems to be the proper tactic when it comes to Iran’s recent overtures. The next few weeks will be key if a compromise is possible—with better relations to follow. My gut tells me this is just a slick Iranian negotiating strategy, but I hope I am wrong and the only way to know for sure is to try. Iran Shows Its Hand Before P5+1 Talks? Comments by Parliamentary Speaker Ali Larijani suggest Iran may be paving the way for a nuclear deal. Back From the Brink: Iran and America Set for Talks?Will America Seize the Moment on Iran?Trump Withdraws US From Iran Deal, Reimposes Sanctions: Here's What's NextReformists Make Gains in Iranian Elections. Now What? Will Iran Keep Its Promises?